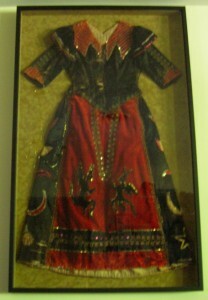 Several years ago for my birthday my husband bought me an antique witch’s costume. As in, a Halloween costume from the late 1800s/early 1900s. It was in pretty rough shape, but still beautiful, and I loved it. I had always planned on giving it a proper display treatment, but to my great shame for years it was displayed by having it hang on a wire coat hanger attached to a tack in the wall. Recently, prompted by a 60% off all framing sale at our local Michael’s, my long standing shame has been transformed into beaming pride.